Several years ago, I became enamored with the Spartans. I especially liked their obsession with laconic wit. In a Wikipedia entry under the term “laconic phrase” it is described as a concise or terse statement. These laconic phrases often had a biting edge to them. And so, when I came across the story of the group of Samians who came to Sparta in search of aid I instantly knew what I wanted my blog to be named. Said Samians were in need of food. Upon reaching Sparta, they went before the Spartan magistrates and pled for assistance. Their speech was, in the typical fashion of the day, long and flowery. The Spartans response? The Samians needn’t have said ‘the bag’. 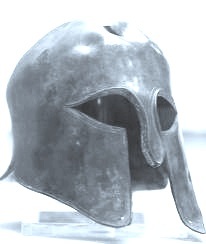 Nevertheless, the Spartans did send aid. And so, with the realization that it is absolutely critical to always keep the reader in mind, I named my blog thebagwantsflour.